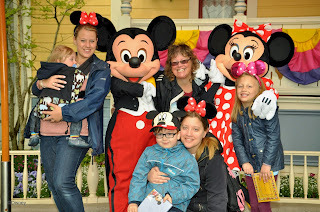 Hello again, here are a few hints and tips that I find helped me on our little Disney trip. 1) Book your Eurostar tickets way ahead of time. We booked them as soon as the dates we wanted came out and got them for about £30 each and after a few weeks they went up about £80 to £100 each. We also got a seat where we were all facing each other with a table in between us so the kids had lots of room to play and do their drawing. 2) Book the Disney Express. When you get off the train you take it to the Disney Express counter at the station and then take it to your hotel. They also give you your tickets to the park on the train so you can go straight to the parks and have fun. 3) Have a rough plan on which park you're planning to go to and what you're doing for food that day, just so you can see all the parades you want. 4) Meeting the characters. Sometimes you can just go and queue to see one of the characters or if you want to meet one of the princesses you can go and get a fast pass, but you have to go and queue very early to get a good time. If you go later in the day you can still get to see them but for a later time, maybe at 5pm, so if you're in the park all day that's the best thing to do instead of queuing just to get a time then having to go back later to queue again. 5) Spend some time in the hotel. Most of the hotels have a swimming pool. One afternoon we just stayed in the hotel for a few hours so we could have fun at the park at night and enjoy the fireworks. It was meant to be for the kids to have a nap but we went to have a swim instead. It was nice but the kids were very tired by the end of the night.